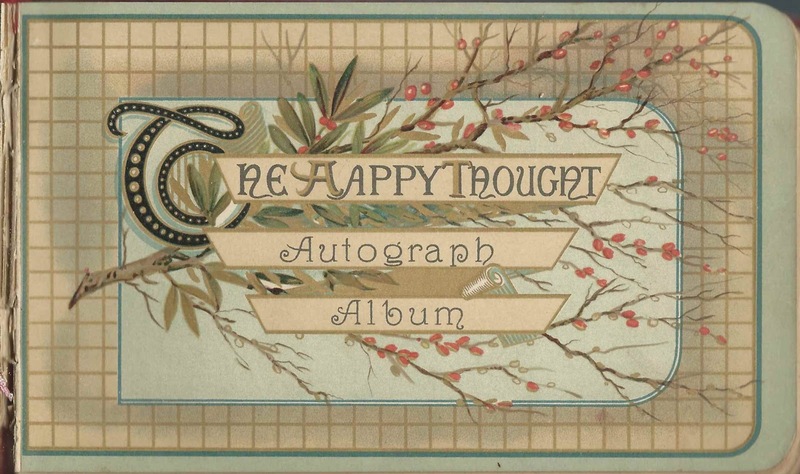 1886-1890 autograph album that belonged to Frederick Fair of Missouri, a student at Avalon College, initially located at Avalon, Missouri, and moved, in 1890, to a more convenient location at Trenton, Missouri, which lay along a rail line. Fred didn't inscribe a page in his album, but his identity was confirmed by the first inscription in the album, that of his parents, Thomas Fair and Nancy Isabell (Shields) Fair, "Nannie", and by inscriber H. M. Ambrose, who directed his sentiment to "Fred Fair". H. M. Ambrose was Hugh M. Ambrose, first president of Avalon College. 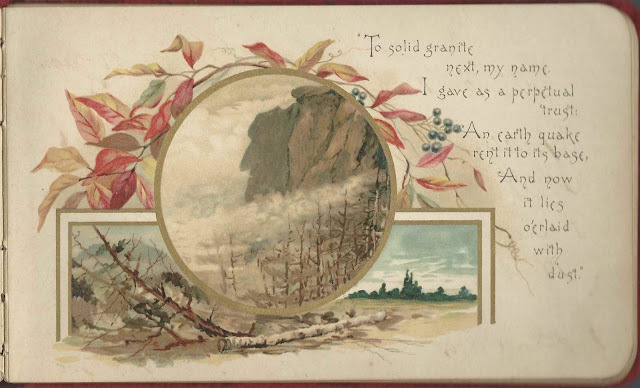 The album measures approximately 7" by 4-1/4" and contains several illustrated pages and the sentiments of 38 of Fred's relatives, friends, schoolmates and college instructors. An alphabetical list of the inscribers, together with any personal information they offered, appears at the end of this post. Frederick J. Fair was born July 6, 1871 at Avalon, Missouri, the son of Thomas Fair and Nancy Isabell (Shields) Fair. It doesn't appear that any of Fred's siblings inscribed pages in his album. However, relatives who did inscribe pages include his maternal aunt, Rebecca Ellen (Shields) Blaine, shown below, and husband William Morrison Blaine, and two of their children, Fred's cousins Harry Elmer Blaine and James Shields Blaine. G. P. Macklin; inscribed at Avalon, Missouri, on February 12, 1887. President of Avalon College, Rev. Gideon P. Macklin. 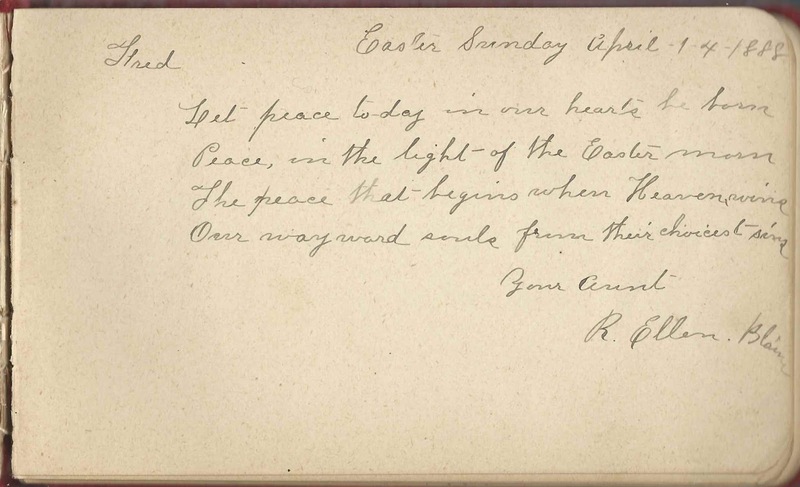 The Mrs. L. A. Macklin who inscribed a page was presumably Rev. Gideon P. Macklin's wife, Mary Elizabeth (Arford) Macklin, who could have gone by Lizzie A. Macklin. J. O. Rankin; presumably Jabez Otterbein Rankin, Mathematics professor at Avalon College. 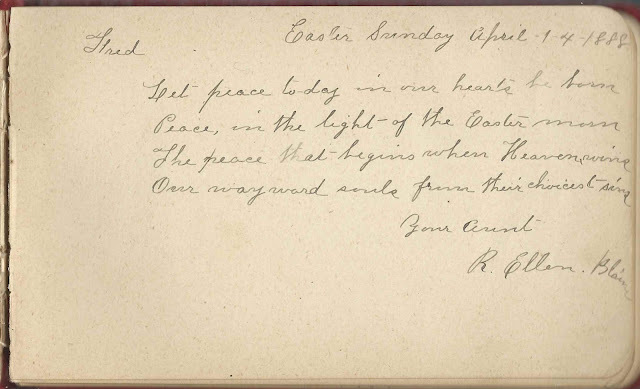 His future wife, Hattie Beauchamp, also inscribed a page. F. E. Washburn; inscribed at Avalon, Missouri, on March 6, 1887. Member of the faculty at Avalon College. On August 12, 1903 at Avalon, Missouri, Frederick J. Fair married Nellie Amanda Miller; they had at least one child, son Frank. About 1910 Fred set up a law practice at Avalon and practiced for the next 30 years. 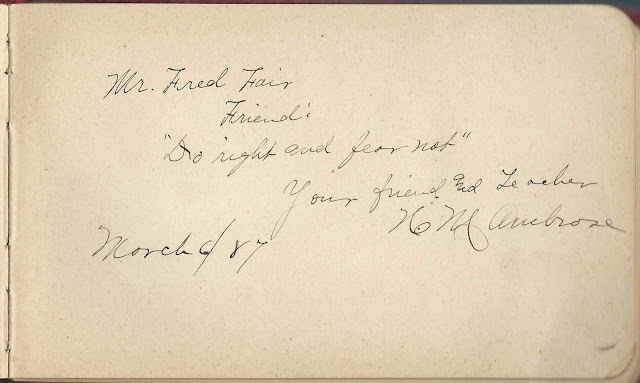 Nellie died in 1926 and Fred in 1965. They're buried in the Ridge Park Cemetery at Marshall, Missouri. Hattie Beauchamp; inscribed at Avalon, Missouri. 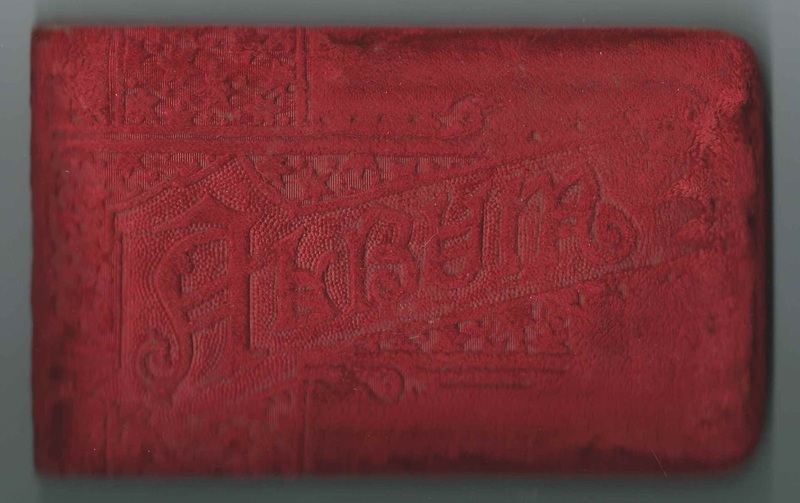 She would marry inscriber Jabez Otterbein Rankin. Harry Blaine; inscribed at Avalon, Missouri, on January 6, 1887. Fred's cousin Harry Elmer Blaine, son of William Morrison Blaine and Rebecca Ellen (Shields) Blaine, sister of Fred's mother Nancy Isabell (Shields) Fair, "Nannie"
Shields Blaine; Fred's cousin, possibly James Shields Blaine, son of William Morrison Blaine and Rebecca Ellen (Shields) Blaine, who was a sister to Fred's mother Nancy Isabell (Shields) Fair. W. M. Blaine; Fred's uncle William Morrison Blaine, husband of Rebecca Ellen (Shields) Blaine, sister of Fred's mother Nancy Isabell (Shields) Fair, "Nannie". 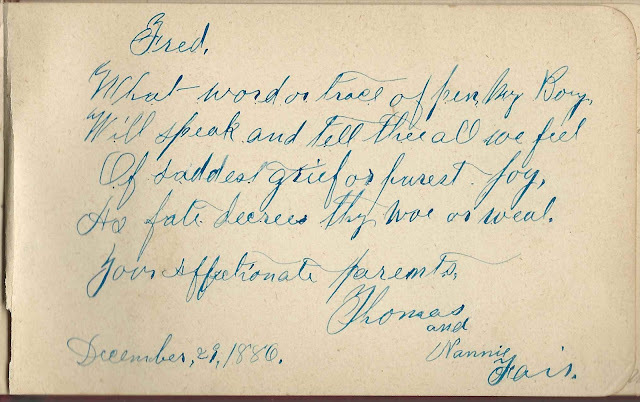 Nannie Fair; inscribed on December 29, 1886, along with her husband Thomas Fair. She was Nancy Isabell (Shields) Fair, "Nannie". Fred's parents. Mrs. L. A. Macklin; inscribed at Avalon, Missouri, on January 26, 1877. She was presumably Mary Elizabeth (Arford) Macklin, wife of Rev. Gideon P. Macklin. She may have gone by Lizzie A. Macklin. John B. Toomay of Finney's Grove, Missouri; inscribed at Avalon College at Avalon, Missouri, on January 19, 1887. Fred's schoolmate. He became a Congregational minister at St. Louis, Missouri.